This is an important contribution to the continuing debate on Nietzsche's views - early and late - concerning epistemology and metaphysics. Doyle's study is particularly insightful on the relation between Nietzsche's later perspectivism and Kantian transcendental idealism. Her awareness of the issues and philosophical scholarship are exemplary, and her conclusions throw fresh light on the specific nature of Nietzsche's indebtedness to Kant. I strongly recommend this book to anyone interested in this area of Nietzsche's thought. 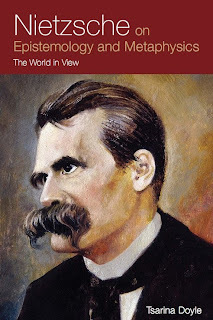 -- Dr. Peter Poellner, Philosophy Department, University of Warwick This is an important contribution to the continuing debate on Nietzsche's views - early and late - concerning epistemology and metaphysics. Doyle's study is particularly insightful on the relation between Nietzsche's later perspectivism and Kantian transcendental idealism. Her awareness of the issues and philosophical scholarship are exemplary, and her conclusions throw fresh light on the specific nature of Nietzsche's indebtedness to Kant. I strongly recommend this book to anyone interested in this area of Nietzsche's thought.